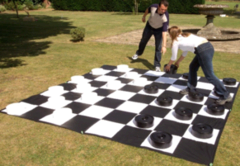 Giant Checkers Set...complete with 10ft x 10ft board and pieces that are as tall as 25''. This unit comes with a vinyl checkers board...that can be staked down in grass or placed on a hard surface. Please consider upgrading to our tiled floor for a more elegant look.